The products from the willow operation included many everyday artefacts such as chairs and baskets. It is not known how many genuine Beckingham willow products remain in the village, but it would be interesting to discover. Likewise it would be interesting to know what other remains of the willow operation remain in the village - for example there may be, lying around in outhouses, curious Y-shaped pieces of wrought iron. 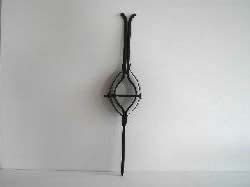 These were a tool used for stripping the willow bark. 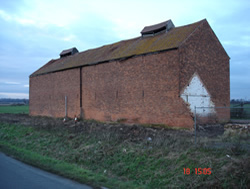 The willow works is built in a style unknown elsewhere in Nottinghamshire and it is unlikely there is another similar building in the whole country. It is a unique feature of the village's, county's and, probably, country's agricultural and industrial heritage. From the road, the building may look rather forboding, with its long, windowless south wall. Outbuildings at the two gable ends are either in ruins or else completely removed. The north wall, however, has many windows and two large doors - one to the ground floor and one opening straight into the upper floor. This pattern of fenestration is the opposite way round to that in many of the older cottages in the village. These are aligned with the gable ends at west and east, a north facing wall with few, small windows and a south facing wall with more, larger windows which catch the warmth and light of the sun (they certainly knew about solar power in those days). The willow works was built deliberately so that the sun's heat would not overheat the inside of the building and this would prevent the willow from drying too quickly. The north facing windows allowed enough light for working.